The Montgomery County Gazette did a story on the reaction of local governments to the lawsuit against Montgomery County’s contingent fee contract. The story points out how several other governments actually followed Montgomery County’s lead by signing contracts which pay the contractor based on the number of tickets issued. The governments doing so include Baltimore City and New Carrolton. Strangely enough their claims as to why their respective deals are legal are almost the same as the arguments Montgomery County makes, just as their contracts are very much the same as Montgomery County’s contract (paying a cut of each ticket to a vendor who owns, maintains, and processes violations from the cameras). So it appears that what they have learned from the Montgomery County lawsuit is a) that it takes years for a plaintiff to bring such a case to trial b) that even if they are found to be in violation they will be allowed to keep most of the loot. 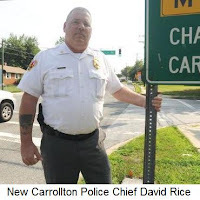 In that article New Carrollton Police Chief David Rice make s a very specific claim: "We operate it ourselves," he said of the program. "[The contractor] isn't allowed to touch [the cameras]." Now that is very interesting, because we have obtained both a copy of New Carrollton’s contract, which pays Optotraffic a 40.5% cut of the paid ticket revenue (or $16.20 per ticket). That contract states “Optotraffic will perform routine maintenance on its equipment”. Optotraffic also arrange to have the annual calibration checks performed on the devices. So they do that without touching the cameras? 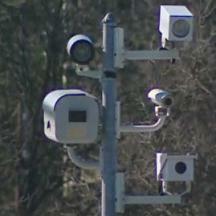 And more to the point, this website had already obtained and previously posted a photo of two technicians who identified themselves as Optotraffic Employees, driving a vehicle which was apparently not county or city owned, but clearly performing work on an active speed camera without a city representative present. So why is Police Chief David Rice telling the media and the public a BOLDFACED LIE that their contractor never touches the cameras? We do not make a habit of criticizing police for following orders. We do support strict enforcement of traffic laws by humans, and we also have it on good information that many police officers do not like speed cameras. But police chiefs are political appointees, beholding to local elected officials. Under Police Chief Rice’s watch New Carrolton used red light cameras to systematically ticket drivers who came to a full stop at intersections. Even though a district court rejected by throwing out many of these tickets, the new Carrollton PD’s websites states in its FAQ that they still engage in this practice: “Q: I received a Red Light Camera ticket in the mail, but I am sure I stopped for the light. Why did I receive this? A:In addition to vehicles which proceed through the intersection while the light is in the red phase, red light camera violations are also triggered by vehicles which pass the clearly marked "stop line" or enter the pedestrian crosswalk. “ And New Carrollton was one of the first locations in the state to being the practice of creating new school zones solely for the purpose of putting up speed cameras. In this case, one does begin to see a pattern. This would not be the first time a government official has lied about the contingent fee issue. Just before the truth about Montgomery County's contract came out, County Executive Legget told the public "Under the contract, we pay a flat fee". The county had also previously promised AAA that there would be no per-ticket contracts. After the story broke Montgomery County officials made statements no less than three times in 2008 that the per ticket payments would be eliminated, but instead the contract was renewed in early 2009. So if some officials becomes overzealous about perverting our justice system into a revenue generating venture, enough so to lie to the public about it, is that their fault or the fault of the state lawmakers who voted to enable this with statewide speed cameras and put every out of town driver at the mercy of the state’s most corrupt local governments?